CEO Blog: Welcome to the New Year! Home/Posts/CEO Blog: Welcome to the New Year! By now you have probably packed away the Christmas decorations, enjoyed (or endured) a break from work and are gearing up to tackle the new year. 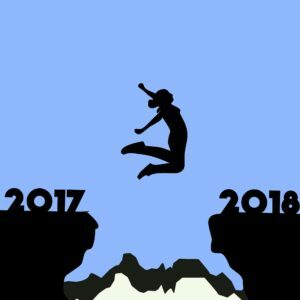 Although you may not actually write up a list of New Year’s Resolutions, many of us use this time of the year to do a ‘stock-take’ of what went well last year, what areas need improvement and what we definitely can not do again. The end result is your very own ‘change management plan’. Easy, right? Well, not always. Despite our best intentions, we often unknowingly sabotage our plans for change, even when we are in total control of the changes. No wonder then that when change is thrust on us, such as changes in our work practices, we feel that we are way outside of our comfort zone and start to dread what may be ahead. The good news is: the fear of change is usually worse than the actual change itself! When we really think about it, change is an essential part of being human. As we learn, adapt, reflect, practice, discuss, consider and share, we are actually changing. It may be a change in how we respond or act (behavioral change), or a change in what we think about (cognitive change). The sum of all of these changes enables us to continually adjust the way we interact with our environment. No 1: Commit to the Change – You need to ‘own it’, so make sure it is a change that you REALLY want. Don’t focus on what you want to STOP doing, instead, think about what you want to achieve through this change. No 2: Be Realistic – We know that aiming high can be motivating, but if the goal is too high you are just setting yourself up for failure. Focus on achieving just one or two of your resolutions instead of a shopping-list size of ‘maybes’. No 3: Make a Plan – I like one of the core tenets of the Results Based Accountability (RBA) framework: start with the what the end result will be, then work backwards step by step to determine how you are going to get there. No 4: Stay Flexible – Accept that life isn’t perfect, and you will have to face challenges along the way. Think about some of the potential issues and develop a strategy to manage them. If, along the way, you realise that your resolution is not what you thought it would be, don’t consider it as a failure, it may just be reality. No 5: Stay on Track – Break your goal down to smaller milestones. As you achieve each one, tick them off and have a little celebration (say out loud ten times: YAY ME!). The good feeling this generates will help motivate you to achieve the next milestone. No 6: Stay Focused – Use reminders to help you to keep your resolution front of mind. You could do this through your diary, notes-to-self left in strategic places (on the fridge door, for example) and a weekly To Do list. No 7: Reward Yourself – When you achieve your goal through the changes you have made, give yourself credit for what you have accomplished. It could be as simple as giving yourself permission to have that extra piece of chocolate, or to stay in bed 20 minutes longer or see that new movie. Achieving your New Year’s Resolutions are examples of how you can manage change, and how to achieve goals. These are two of the basic fundamental personal development techniques and core business strategies. The next time you hear the word ‘change’ in your workplace don’t go into panic mode; remember you are the curator of your change management techniques. Its what you do each and every day. Change? Bring it on I say!